Reserve Little Cove Hideaway Today! We very much enjoyed the property. My daughter enjoyed using the hot tub, big garden tub, and pool table. The location was pretty good. Some of the roads were a little difficult but we managed (I.e. no lines on the roads in some spots so hard to see what was the middle & side when mother car came especially in the rain). Compared to the other cabins I’ve stayed, it was a smaller space for the money paid. One of the pool table sticks was broken and just put back in the holder. I was the most disappointed with the cleanliness. The bathrooms in particular. The rugs did not appear to have been washed recently (kitchen either), were cob webs, and hair on the floor. The cleaners did not earn their cleaning fee from the previous renter. Hopefully, they earned ours for the next renter. The cabin needs a thorough cleaning, cobwebs on the walls and fixtures, tub needed scrubbing. That said though we loved the cabin, it was just the perfect size and had everything in it we needed. Maintenance was excellent. The pilot light was turned off on the fireplace. I made a call and the nice lady said she would have maintenance call me to tell me how to relight. Well he was even better than that, he arrived about 15 minutes later and relit the light. Very prompt service. We would definitely rent this cabin again. Enjoyed our stay but the cabin really needs a good cleaning and several things updated!!! Little cove hideaway was the cutest and coziest little cabin. My husband and I spent our honeymoon there and it was wonderful. The view was more of a woodsy view rather than mountains. However there’s a cute cow pasture you can see through the trees. The cabin smelled good and it was clean. Would definitely stay there again. maintenance was very responsive and corrected an item the same day we requested. they do need to steam clean or replace the carpet and upholstered furniture, though. there was plenty of room for our family of 4, and I would stay there again. Beautiful cabin but time to update sofa and loveseat. Luckily this cabin had an extra driveway to back out of property, if not would have been difficult to get in and out in my Dodge Ram 1500. Gas grill needs attention also. Other than this we really enjoyed our stay here. Quiet and very relaxing. Would definitely return. We loved the place except it was terrible having no WiFi and no cell service..
CabinsUSA is a fabulous group of folks! We accidentally left a very valuable item in the cabin upon checkout and it was found and secured for our pick up the next day! This cabin is in a great location and provided a peaceful, serene environment for relaxing. The cabin was relatively clean but could use a good deep cleaning and dusting. There are an abundant supply of dishes in the cabin, however, only minimal silverware or pots for cooking. We actually had to go into town and purchase a pot to cook in. Overall, it was a great stay and we'll certainly book with CabinsUSA again. This was our 3rd year to book with you. Love the convenience and the easy checkout but this year the clerk that checked us in was not in my expectations as she should be but I took it all in stride until my daughter said she rolled her eyes as we were leaving and I sure hope she wasn't making fun of me since I was having trouble walking. Other than that our trip was great . Now last November your staff was not like this. Everything was wonderful ! Great experience here at this cabin. Enjoyed the relaxing time spent on the deck in the hot tub ! Will be returning ! Really needs a lot of upgrading on flooring and more cleanliness. Otherwise it was fine, needed cleaning in the bathroom more found some bugs on the sink, around commode was dirty and floor . The cabin was great. GREAT location. View was not quite what I wanted, somewhat obstructed. The size was perfect for the 2 of us. Hot tub was wonderful. I texted any issues I had when I sent 'check out' text. Overall...no complaints except there is no cell reception and no WIFI and there is no local TV stations available. I was thrilled with the nightly charges as a returning guest. I will definitely use that feature again. We was disappointed when we went to turn on the Tv's in the bedrooms neither of the Tv's had satellite in the bedrooms the beds was not comfortable..the location was close enough to the parkway for us the cabin was secluded even with other cabins close the hot tub and jacuzzi was nice the kitchen was stocked nicely the only thing the pots and pan where in rough shape due to being used other then that the kitchen was ok the gas grill was great we used it a couple times the couch was a little uncomfortable . The cabin just needs a little TLC and it would be a great place...As for cabins USA we have used them the last 5 times we visited Pigeon Forge and we have been very satisfied and we will continue using cabins USA Thanks! This cabin was perfect for my fiance and I's stay in Pigeon Forge. It was about a 10-15 minute drive to the main strip. Perfect distance to both Pigeon Forge and Gatlinburg. Even though you can see other cabins through the woods, it is still very secluded. You can hear the frogs creek at night, which is very soothing. The hot tub worked great and was a perfect way to wind down at the end of the day. We didn't use the pool table but it was in good condition. The Jacuzzi in the upstairs bedroom was large but a little too large to fill all the way with warm water. Other than that, it was a great stay and I will definitely rent again! I am so happy to hear that you and your husband enjoyed staying in Little Cove Hideaway! We here at Cabins USA work hard to make sure each of our guests have the best stay possible while vacationing in the Smokies. When you are ready to stay with us again, please mention you are a return guest for an additional discount. Thank you again for choosing Cabins USA and we look forward to seeing you again soon! Animals living inside kitchen wall above window. And carpet needs replacing. Otherwise cabin is beautiful. The place was nice. The bed upstairs was very uncomfortable. The tv channels really didn't work to good. Think that was because of the location. Every night it sounded like a big rat in the rafters. The check in and check out was a breeze. Had one issue with the fireplace, called maintenance and they came right out and corrected problem. Very enjoyable stay. Would recommend to anyone and would stay with cabins usa again. I absolutely loved the Little Cove Hideaway and it's secluded location. I have nothing negative to say about it. I would highly recommend staying there and I would highly recommend using Cabins USA for booking. They are wonderful people. I didn't want to leave once I got there and I definitely plan on going back. The cabin was as advertised online - beautiful! Very relaxing vacation. We could not get the outdoor grill to work, but otherwise we did not have any issues with the cabin. We're already planning our vacation for next summer and will definitely be considering another cabin vacation. Thank you for all of your kind words! We here at Cabins USA work hard to make sure each of our guests have the best stay possible while vacationing in the Smokies. I apologize for the issues you experienced with the grill. Your comments have been forwarded to our Maintenance department to be addressed. When you are ready to stay with us again, please mention you are a return guest for an additional discount. Thank you for choosing Cabins USA and we look forward to having you as our guest again! My wife and I had a wonderful weekend getaway at this cabin. Located off the normal path and very private and secluded and completely relaxing.... just what we needed. Overall we will use Cabins USA for our next visit to the mountains.... easy to contact, easy to work with and check out was a simple text. Thank you for taking the time to let us know about your recent stay in Little Cove Hideaway! We here at Cabins USA work hard to make sure each of our guests have the best stay possible while vacationing in the Smokies. When you are ready to stay with us again, please mention you are a return guest for an additional discount. Thank you for choosing Cabins USA and we look forward to having you as our guest again! We had a great time! Check in was pretty quick and very efficient. I really appreciated all the information that was in the check in packet. It spelled everything out for us. The property itself was near town but pretty secluded, we enjoyed ourselves very much. Checking out was a breeze! This was one of the best vacations I ever taken. We loved the cabin and location. Close proximity to everything we wanted to do. It was decorated for Christmas which was a real plus. We are planning on booking again in the spring or fall. This cabin was perfect for our family! There were five of us and we were very comfortable. The location was great, off the beaten path but still close enough to Pigeon Forge and an easy drive to Gatlinburg. The only thing we would have liked to have was an outside fire pit or ring to have camp fires. As for Cabins USA, I will 100% book with them again. It was an easy check in and easy check out and the staff was really professional and courteous. We never had any issues for them to correct but they did call us to make sure everything was ok and we didn't need anything. Pillows were terrible. Shower in downstairs bathroom wouldn't come on. Could have used more towels! Could have better pans to cook in. Other than these few issues, we loved the cabin!! Loved the hot tub and jazuci!! We used gas grill a lot. We will rent again from Cabins USA. Can't beat the price!! Thank you for your review we appreciate your feedback on your stay with us. We are delighted that you had a great stay with us. We are delighted that we were able to address the issue in a timely manner. We hope that we hear from you again soon. The cabin was very nice and decorated beautifully except the carpeting in the living area was stained and in disrepair. Also the linoleum floors in both bathrooms was also discolored and a little moldy. If those items were updated the cabin would be worth its price. We loved the service that cabins USA gave us. Everyone was very friendly and they came out right away when we had an issue with the satellite TV. Thank you for your review. We are glad you had a good stay with us at Little Cove Hideaway. We are having the carpets cleaned as soon as we can get it scheduled, and we are having the bathroom floors inspected immediately. We are glad that we were able to provide you with great customer service during your stay with us. 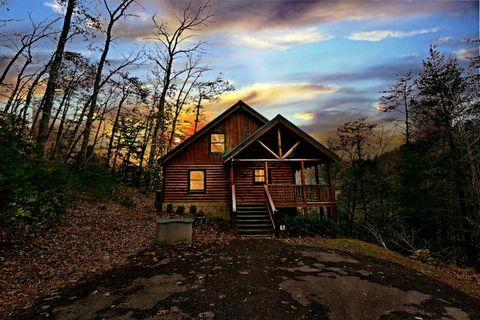 Cabins USA always strives to offer the best customer service and memorable stays in the Smokies. We hope that we will hear from you again soon. Absolutely loved this cabin. Off the beaten path, but only minutes from downtown. Nice. We will stay here again. Thank you for taking the time to write your review Larry. We apologize for the inconvenience you experienced. We are excited that your did enjoy your time with us at Little Cove Hideaway. We hope to see you again in the near future. First time renting a cabin. Staff was friendly and the cabin clean. One minor issue due to a bad storm and they took care of it promtly. Made the whole experience enjoyable will do it again. The cabin was well maintained and very attractive. IWe felt very at home. Location was nice with easy access. We really enjoyed our stay. The staff was very friendly and check in /out was very simple. I booked on line with no issues. I would most deffinately stay at this property again or another property managed by Cabins USA. Arrived 8/29 for 3 nights. Check in was fast and easy. Friendly staff. Little Cove Hideway was nice and cozy and my wife and really enjoyed our stay. The drive from cabin to Gatlinburg was about 18min but no big deal. We had everything we need in the cabin. Real clean inside and bathrooms were also very cleaned. The master bedroom bed was ok.....need a more comfortable mattress. The pool table can be challenging sometimes depending on your angle shot...really not enough room for it but that wasn't a deal breaker because we didn't use it much anyway. Nice location...view is ok...probably better during the fall, winter season. I recommend this place and my wife and would definitely be coming back. My biggest complaint is that even though we got there at 2pm we had to go back through traffic and come back at 3pm to the office to get location and code. Aggravating. !!!!!!!!!! Little Cove Hideaway was very clean and comfortable, except for the king sized mattress in the upstairs bedroom. It was by far, the worst mattress we have ever slept on. The sagging and creaking was really bad. The only other complaint was something that cannot be helped. The floors upstairs and staircase were very creaky. Since there were only the 2 of us, we didn't disturb anyone else, but if others had been trying to sleep downstairs, if would have posed a problem. The privacy of the cabin was nice. The comfort of the rest of the furniture was great. The only problem of the location was the narrowness of Starwood Way, if meeting another vehicle. We learned how to pull into the driveway without "taking out" the front bumper of the car, but the first night we arrived when the lighting was not good and thought we had damaged the car on the upper edge of the driveway entrance. We usually rent through Hearthside Cabin rentals and the only thing we like better with their check-in process is that we don't have to go by their office, if we have emailed our driver's license and taken care of payment, etc. prior to our arrival. They email the directions to the cabin about a day before our arrival and then we call for the key code on our way to Pigeon Forge. We also don't have to call when we have checked out, but I do see how calling might help the housekeepers know that it's okay to go on and clean. We had a very nice time. We would have like to have internet, a little closer to town and there was not a good view at all. We would stay with Cabins USA again, but not at that cabin. I know I was told the cabin was new to Cabins USA, but it does need a lot of work. Although Bluegreen booked the property for me, it appears your process is simple and user friendly. Check-in was a breeze, and the staff was extremely courteous, friendly, and professional. Check-out could not have been more convenient -- a phone call to the office was all it took. I did notice a couple of areas requiring attention to detail on cleanliness: heating/cooling vents needed vacuuming, baseboards in several areas could have used a simple dusting. Really enjoyed the gas logs, and the pool table was a definite plus. The 2BR/2BA cabin was perfect for our needs. We did have a problem regulating the heat; it was difficult to regulate, and the upstairs was very warm, while the downstairs was cooler (but comfortable). The location was what you would expect in the mountains (very scenic), and even though the distance to attractions and restaurants was a bit lengthy, it was not a big inconvenience. I will definitely consider Cabins USA for lodging in the future and recommend your properties to others.